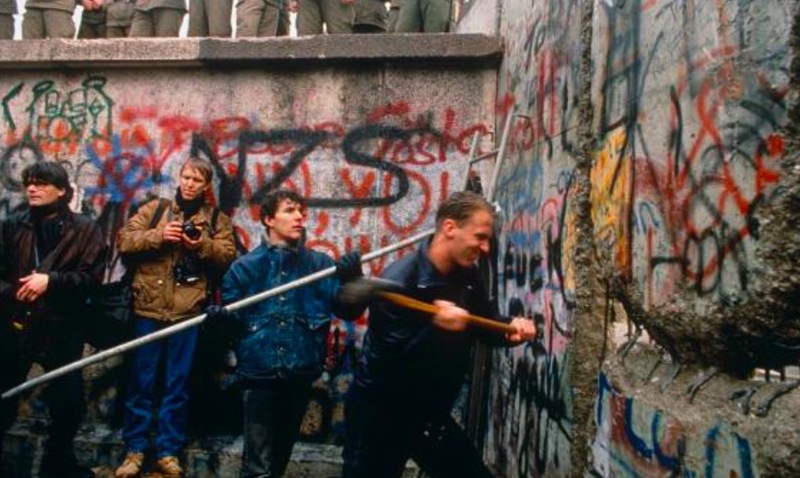 It was 1989 and the Berlin Wall had just fallen. To the envy of every good and young adventurer, I was privileged to be sitting upon it when it did. Armed with a sledgehammer and spray paint (more about that later) we carved out a memory that would last a lifetime. The end of the soviet era came crumbling down and I was honored to have played a role in it, one hammer throw after another. I still treasure the barbed wire and slabs of the wall that I was able to transport home in my carry-on luggage, a pre-9/11 luxury that we will never see again. Many were the lessons of that night, but there was one in particular; getting robbed at knifepoint. In the midst of the excitement and speed of the soviet fall, entrepreneurialism fell upon the region just as hard and fast. Allow me to explain. From the time that the wall began to teeter until the moment the first slab hit the ground in a swirl of soviet dust, vendors sprung up selling souvenirs, pieces of concrete, key chains and of course hammers. It was as if they were just below the surface of the earth and with the thud of the first slab of concrete, they sprung forth in mid-sentence selling their wares. It was a rented sledgehammer that plays center stage in my story. You see, my friend Greg and I rented a pair of them to leave our mark on history. At the first sign of crumble, the entrepreneurial spirit of capitalism drove dozens of future ex-soviet tycoons to purchase sledgehammers and rent them out so that every tourist in Europe could stake claim to a portion of the previously infamous barrier to freedom. Genius! By the end of the evening, pockets full of concrete and barbed wire, we began walking to the place where we were going to return our sledgehammers. That’s when it happened! An obviously late-to-the-party and disgruntled would-be entrepreneur accosted me with a knife. It wasn’t much of a knife, but it was a knife with an attitude behind it. I’m guessing he went to the local hardware store to fulfill his entrepreneurial dreams and found that they had sold out of sledgehammers, so he decided to steal a few so that he too could open his “tools of destruction” franchise. Returning to our would-be musketeer with his little sword. He is now twitching… Really! Ready to attack. In that moment, after all the thoughts about his size and mine, arm length, weapons, angle of attack, strike position, and aftermath, I though about the last scripture I had painted on the wall, John 3:16. Yes it’s true. I wondered who may have seen me paint that scripture and might also see me turn my new friend into a tent peg. I thought about the new me that Father had created only five years earlier and I let the sledgehammer go limp in my hand, handing it to this thief. That was tough! But I learned something valuable, that the war of the flesh can teach us important life lessons. I have learned much from that experience so many years ago. I continue to ruminate over it regularly. Mostly, I am glad I did the right thing so that I pleased Father. Secondly, I am glad because I might still be rotting in a ex-Russian now German prison (smile/wink). Allow me to share my latest thoughts about that amazing moment. Sometimes the best action in leadership is to take the stance of knowing the current reality intimately and acting on what is best to do in the greater picture even though your gut tells you differently. From our thief’s perspective, the right thing to do was to take two or three very clear steps toward his goal. From my perspective, it meant evaluating the situation and acting on what was best for all parties. It’s an easy thing in leadership to walk without strategy—taking steps—hoping it will all work out… At least you’ll be shown to be busy. That approach would have cost our thief some serious pain. It’s a harder thing in leadership to shelve your impulses and review all relevant data, applying it to your immediate context, and then acting strategically. It is a less visceral response, and it is ultimately and usually the correct one. The first is birthed of urgency and the other of importance. To him, his attack was urgent, my response, important. As I process this line of thinking more, I am reminded how we are culturally inundated with immediate gratification solutions to every conceivable situation. I believe we are deeply harmed by this as a society. Nothing good comes quick, easy and without thought. Doing the right thing is hard, not easy. It is slow, not fast. Am I saying that such books have no value whatsoever? No. Only that our dependence upon them, or the expectation we place upon their methodologies have to be weighed. In them, you will not find your Aha. The Aha comes with a deep understanding of your immediate context. Steps without clear objectives can be hazardous. Think about the two steps that my 5′-5″ musketeer was going to take. Two steps to tragedy. I’ve done the research. Here are some other steps that may help drive the point home. Eleven steps to the end of the plank on a pirate ship. One step out of bounds at the half-yard line. 135 steps for a dead man walking at sing-sing prison. Think about this; steps without strategy are dangerous. As a leader appointed by Father, you have an obligation to think strategically, to define and engage your current situation, to get the facts, counsel, and numbers. Measure everything. Rely on His voice. React to the important before the urgent, and show yourself approved.